In this article I will explain how to convert datareader to datatable in asp.net using C#.net and VB.NET. In previous post I explained ExecuteReader, ExecuteScalar, ExecuteNonQuery and differences between ExecuteNonQuery, ExecuteReader and ExecuteScalar in asp.net. Now I will explain how to convert datareader to datatable in asp.net using C#.net, VB.NET. 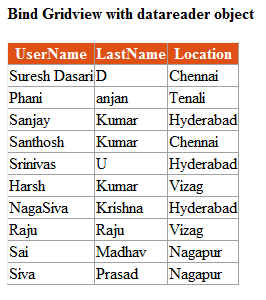 DataReader is used to read the data from database and it is a read and forward only connection oriented architecture during fetch the data from database. DataReader will fetch the data very fast when compared with dataset. Generally we will use ExecuteReader object to bind data to datareader for that check this post ExecuteReader Example in asp.net. Your blog is a perfect guidance to me through which I am learning ASP.NET. On each and every post there is something to learn which is new for me. Got a Clear Understanding now. Thanks a lot.